EVANSTON, IL: Thunder and lightning forced an abbreviated pre-game warm up, but the skies cleared just in time for the second round playoff game to kick-off as scheduled at 6pm. For Pittsburgh the pre-game thunderstorm was an ominous indicator of things to come as Chicago unleashed their full potential in a 45-0 thrashing of a very good Passion team. This was the first time this year that the Force truly played a complete game and the result was astonishing: the offense was humming, the defense was suffocating and the special teams once again delivered a knockout blow. This is the team that Head Coach John Konecki has been impatiently waiting to emerge. "This was a great game for us. We executed in all three phases of the game and we did it for four quarters. I couldn't be happier with my players. And the coaches did a fantastic job getting the players ready for this game. Everyone knew their assignments and we were very prepared. We'll need to continue this level of play in order to win our conference and advance to the National Championship. 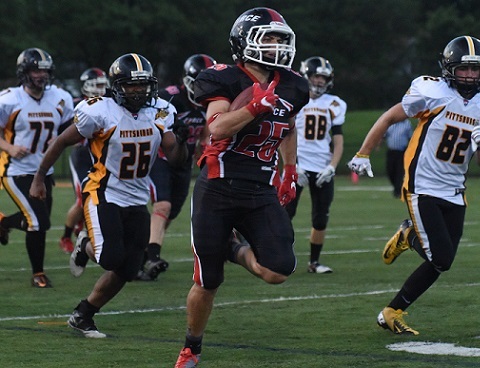 Chicago's offense started with a bang when running back Kristy Moran burst through the line and exploded downfield for a 56 yard gain to the Pittsburgh eight yard line on the first play from scrimmage. Quarterback Sami Grisafe then threw a 4 yard TD pass to Cassey Brick a play later to start the scoring. Chicago's offense went on to score on four of its first five possessions, including a 36 yard TD pass to Tamika Robinson, a 37 yard field goal by Jules Harshbarger, a 1 yard rushing TD by Aleksandra Lukasiewicz, as well as a stunning 85 yard punt return by Brick in the final minute of the half. Meanwhile, Pittsburgh's vaunted offense struggled terribly and was only able to get one first down in the opening half and that was via penalty. Chicago went into halftime with a commanding 31-0 lead. The second half was more of the same with Chicago adding two more rushing TD's by Moran. Moran would finish with 242 rushing yards, an 11 yard reception and 2 TD's, earning her the offensive game day MVP trophy. Grisafe was masterful while completing 27 passes in 35 attempts for 221 yards and 2 TD's. Robinson had a breakout game with 13 catches for 134 yards, gaining much of her yardage after the catch by shedding would-be tacklers. 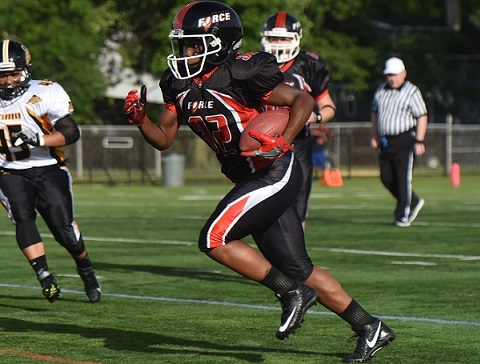 The Force defense pressured the quarterback, forced two turnovers (fumble recoveries by Kelly Washington and Kim Marks), and swarmed to the ball while earning an impressive shut-out. They held Pittsburgh to just 56 yards of total offense. 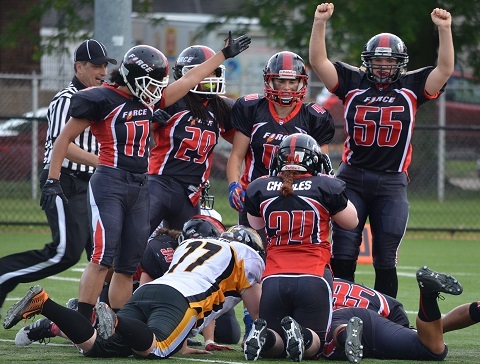 Defensive Game Day MVP Darcy Leslie led the team with 9 tackles, 5 tackles for a loss and a sack. Kelsey Casey had 8 tackles and 4 tackles for a loss. Chicago (8-1) advances to the conference championship vs Boston Renegades (8-0) on July 8th. The game will be in Revere, MA at Harry Della Russo Field, kickoff time TBD. The winner of this game will advance to the National Championship at Highmark Stadium in Pittsburgh on July 22nd. 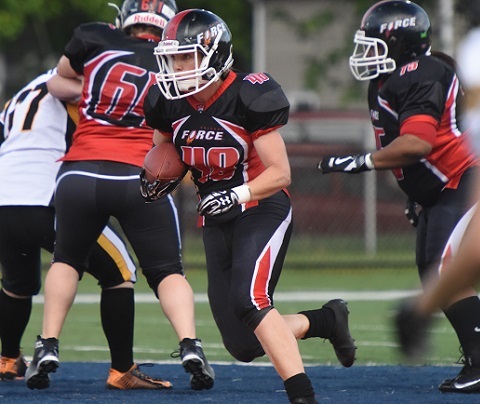 The Women's Football Alliance now has a two week break to accommodate the IFAF Women's World Championship in Vancouver which, like the Olympics, is now played every four years. Eleven Force players and one coach will be in Vancouver for a week of camp and then a week of international competition. The US team is favored to win the gold medal again, as it did convincingly in 2010 and 2013. The Force have six players on the US squad, two on the Canadian team and three players and Coach Konecki competing for Australia. The participants return on July 1st and will have less than a week to prepare for the conference final in Boston.